To this day, Rolex still makes some extremely rare watches. 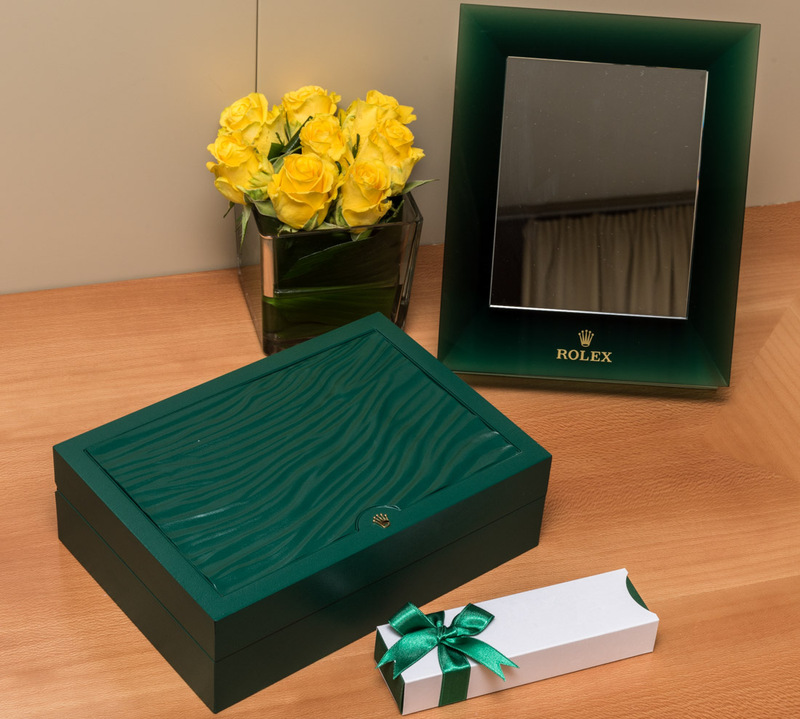 And when you encounter one, things start as unassumingly as a green box, different from the one most of their watches come in, with a Rolex crown at “6 o’clock.” You might agree that this is the typical presentation of a watch built The Rolex Way. What we are looking at today, however, is not your well-known Rolex, but one so rare it is not even listed on the official website or any catalogue. 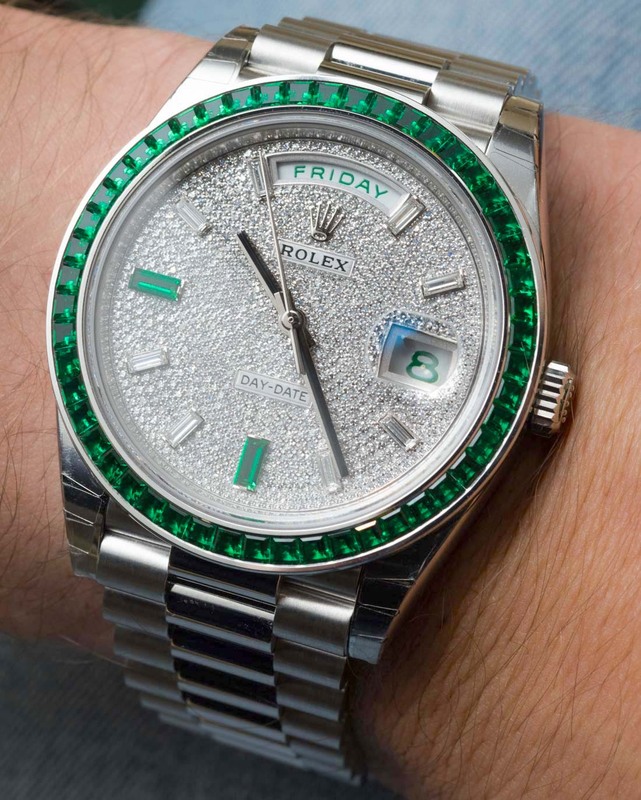 It is extremely hard to come by, mind-bendingly expensive, impeccably made, and shall remain aspirational even for the majority of “one-percenters.” This is the all-factory, solid-platinum Rolex Day-Date 40 Green Emerald Reference 228396TEM, priced very close to the half-a-million-dollar mark. This model is based on the updated Rolex “President” (Day-Date) watch family that debuted in 2015. Rolex has never failed to remain the most well-known aspirational watch, the marker of a certain achievement or milestone in one’s life; and even when those are moments in the past, a bog-standard Rolex will still stand out as “the Rolex” even in the largest watch collections of the world. 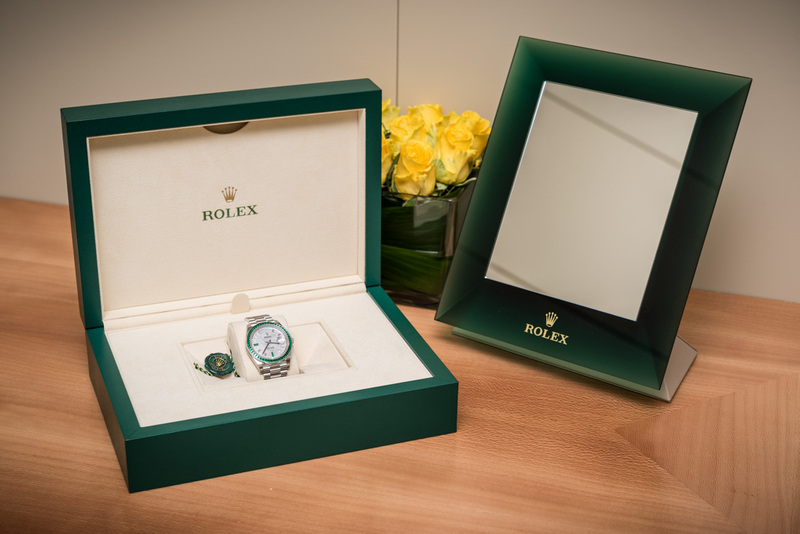 Once you lift the decidedly heavy, green presentation box lid, you are greeted with the most simple and yet complex views of all: some soft padding in beige, a green Rolex tag that indicates an extended Rolex warranty and a more stringent accuracy of -2/+2 seconds per day… and, bang in the middle, one of the rarest watches available today – or, in fact, in a very long time – from Rolex. You may remember seeing some “blinged-out” Rolexes on the wrists of C-list rappers and other, untypical Rolex clientele, but those watches have as much on this, as said “musicians” on anyone who can actually read sheet music – not much. 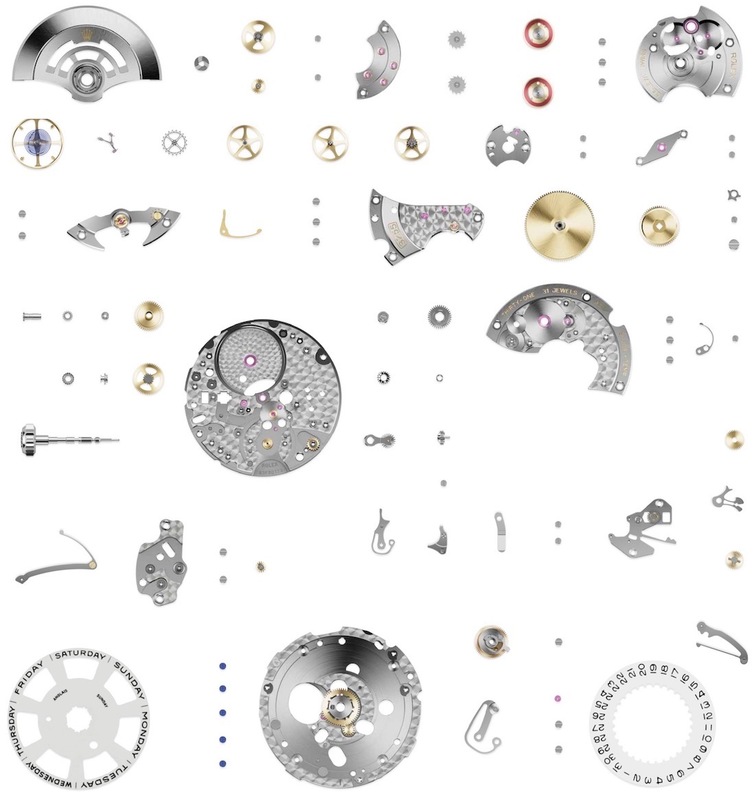 Given the types of watches we cover on aBlogtoWatch, we very scarcely have to highlight the fact that a watch (and especially a modern one) is “all-factory.” The reason it matters so much in this case is because Rolex watches, even original ones in precious metals, are sometimes subjected to aftermarket bling-treatments, where their dials and bezels are modified by fitting stones to them. Needless to say, the resulting aftermarket pieces are almost exclusively horrendous in their execution, and even if they weren’t, they couldn’t come close to the work attainable only by Rolex and its army of gemologists (see point 8 here for more details on that). 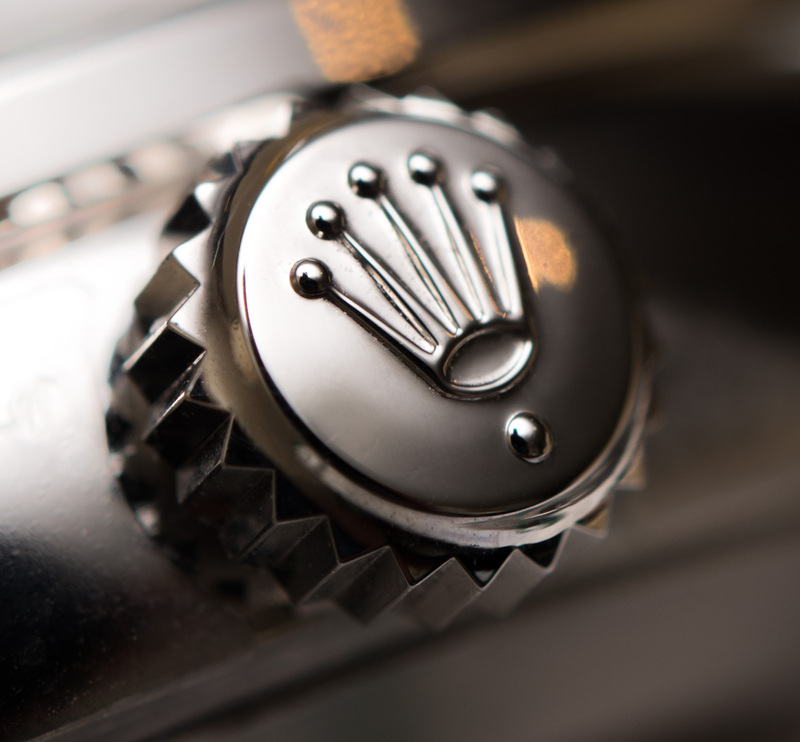 On a Rolex, the single dot below the crown’s “crown” logo indicates: platinum. 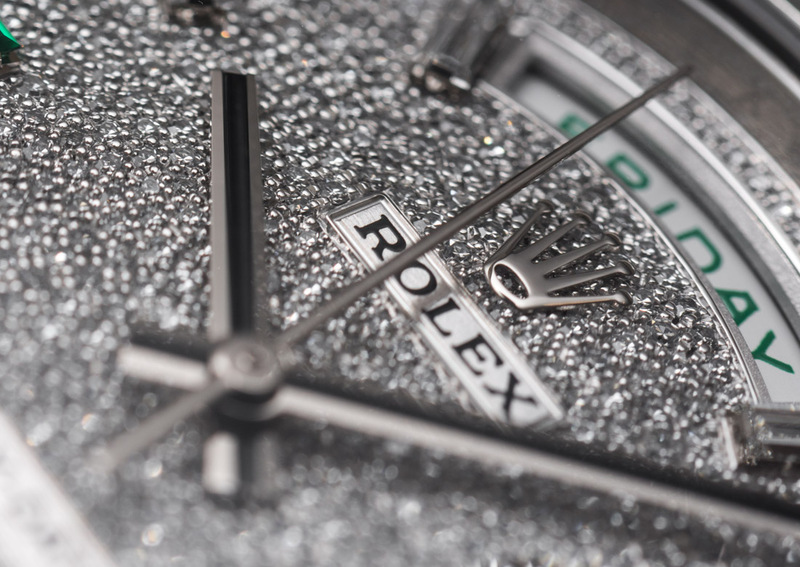 An important reason these high-jewelry watches from Rolex are so rare is that they do actually take a very long time to make – to craft a gem-set bezel (just the bezel) can take between one and two weeks, depending on the color scheme and how challenging the stones are to work with. We talked about this a bit more after visiting the Rolex manufacture that included a visit to their gem-setting department. 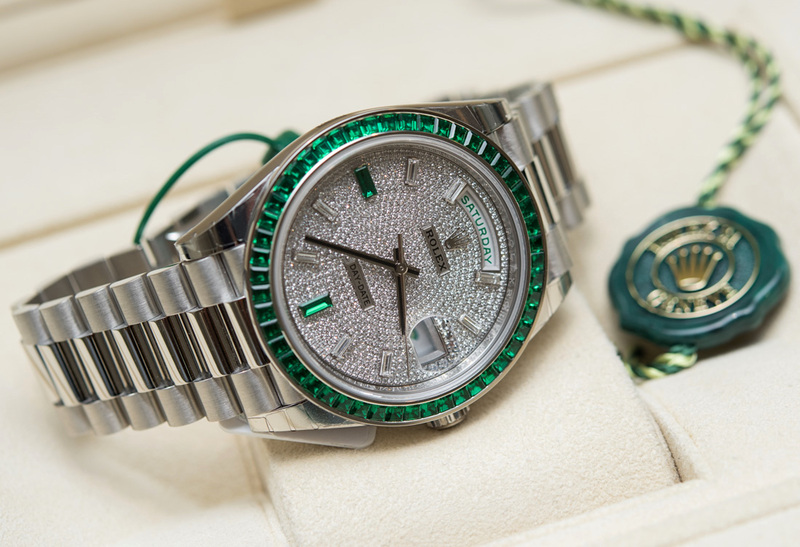 With the Rolex Day-Date 40 Green Emerald, we are looking at a combination of diamonds and emeralds, so let us briefly discuss how Rolex chooses and applies stones for use in such high-jewelry pieces. 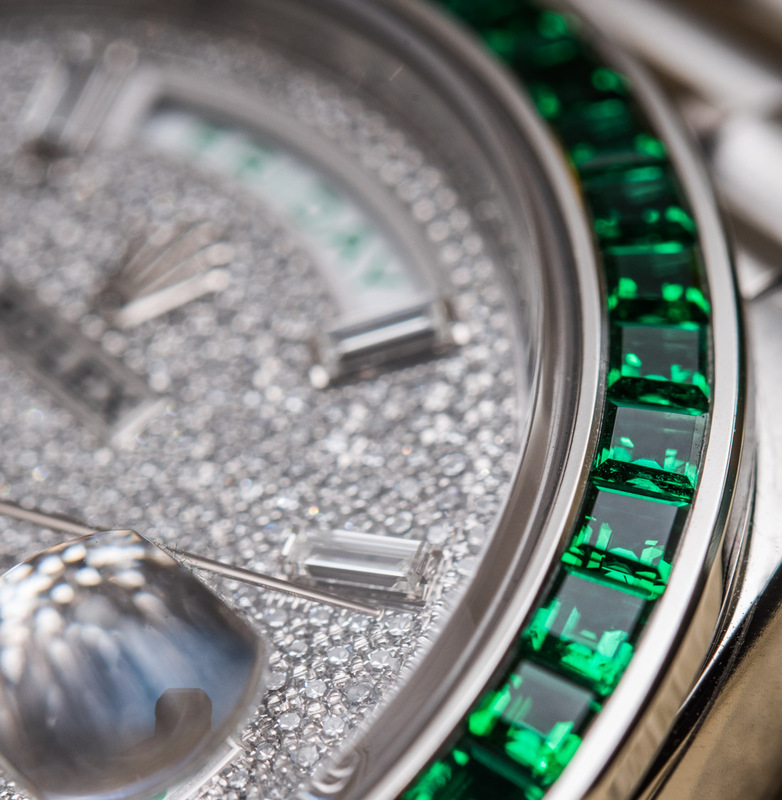 As for color, Rolex says it only sets superior quality diamonds in the colorless category. In terms of cut, which is a decisive factor for the brilliance of a diamond, Rolex uses full cut (or brilliant cut), 8/8, trapeze or baguette cut stones selected from the first two categories of the professional classification scale. 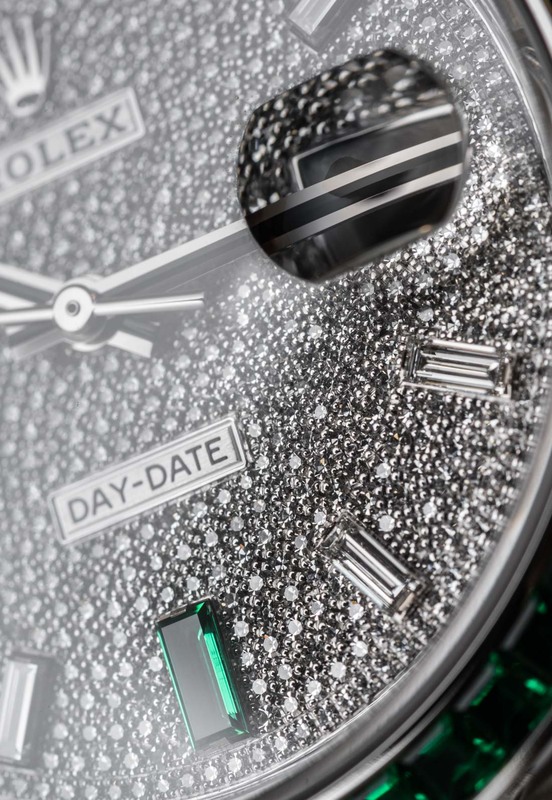 In this instance, the full pavé dial features brilliant cut diamonds both around the periphery of the dial, framing the indices (a particularly neat detail that I just noticed when looking at the images like the one above), and – well – pretty much everywhere else there was available space on the dial. We will add that while there are other good gem-setters out there, most after-market precious stone setting on Rolex timepieces is not nearly as good as what comes from the Rolex factory. 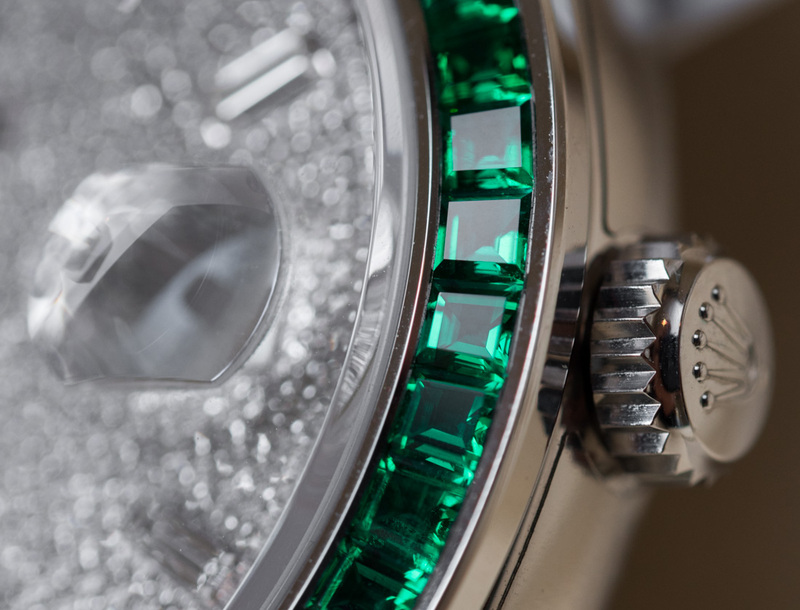 For models set with colored gemstones – rubies, sapphires, or, in this case, emeralds – Rolex takes particular care in ensuring that all the stones on a given watch are of the same hue, using a combination of a long sorting process carried out by hand, stone by stone in the Rolex workshops, as well as by using one of Rolex’s several sophisticated machines that are, Rolex says, usually only found in independent gemological laboratories. The result is genuinely incredible – if one is familiar with precious stones and gems, it is no secret that it takes sorting through hundreds, if not thousands of pieces to find a bezel-worth of stones that are such a perfect match in color. If anything, it is almost (I said almost!) too perfect as, frankly, I hitherto thought such impeccable matching of colors and shapes would only be possible if every stone were entirely artificial. 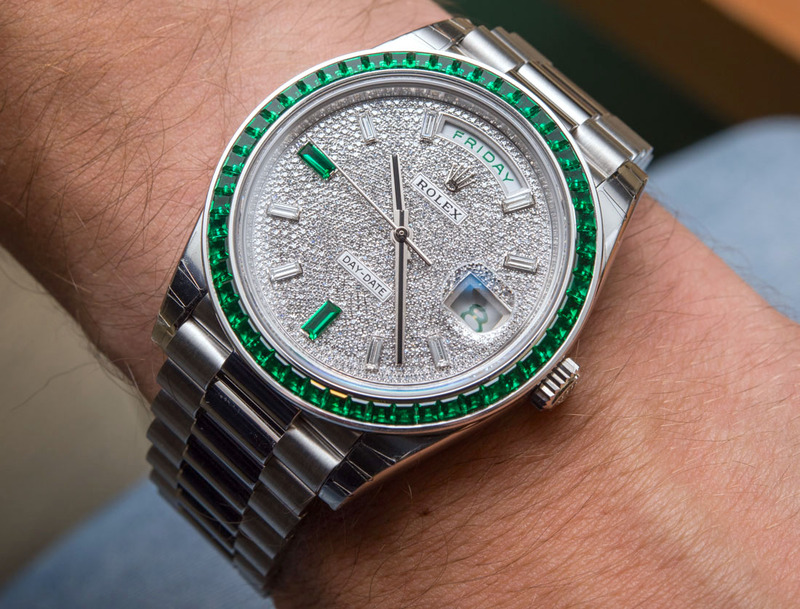 I am no expert in gemology, but I will say that I spent a few hours (I did take my time) taking pictures and checking out hands-on the Rolex Day-Date 40 Green Emerald, and no matter the lighting (ambient, artificial, or natural light), the emeralds of the bezel as well as the substantially sized 6 and 9 o’clock indices looked perfectly alike in color, cut, and overall execution. Even when checking my images I can only wonder at how the light of my camera’s flash entered the tight row of green emeralds and bounced around countless times to seemingly illuminate the bezel from the inside. 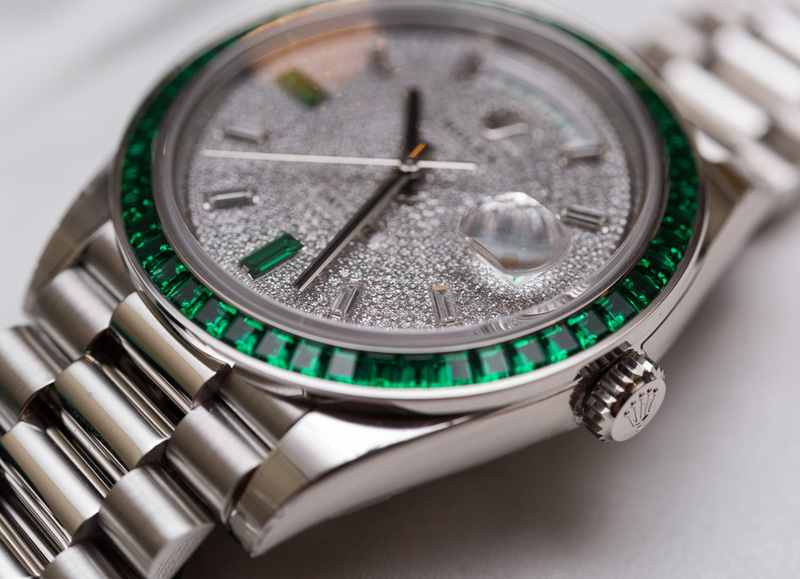 Once the stones have been sorted by clarity and color, they are handed over to Rolex’s master gem-setters, skilled in the various techniques of their profession: bead (or pavé) setting as seen here in this full pavé diamond dial, or channel setting, bezel setting, and prong or claw setting. Getting the colors right is just the beginning to making a high-jewelry piece stand out: the precise alignment of the height of the gems, their orientation and position, the robustness, regularity, and aesthetics of the setting, as well as the finishing of the beads. These technical details all make perfect sense in the abstract, but – again, unless you are a gemologist or professional gem-setter – I feel safe in saying that the exceptional overall quality and look is what will amaze you, so much so that for long after the first look, you will fail to focus on such small details as the height of the stones or their remarkable uniformity of color and hue. Simply holding it in one’s hand (or better still, wearing it on the wrist – more on that in a bit) shows how an item produced with such accuracy and attention to detail remains largely incomparable to 99.99999 (add more nines) percent of other man-made objects. 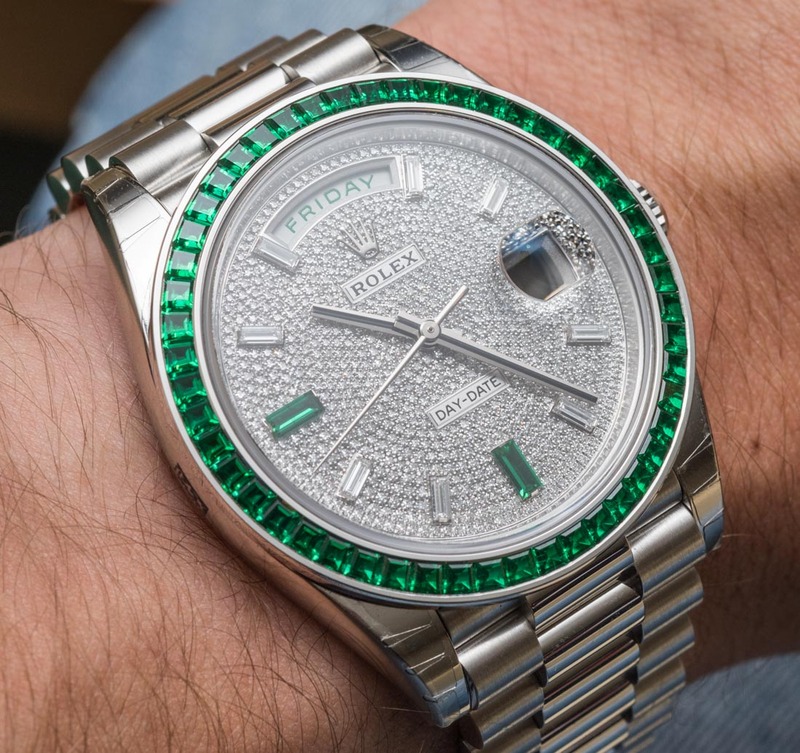 As for the watch itself, here’s something interesting about Rolex’s approach to a high-six-figure-priced watch: the Rolex Day-Date 40 Green Emerald is based on the Rolex Day-Date 40 Platinum Reference 228396, so much so that it even shares the same reference number, simply adding TEM to the six-digit number to indicate the full pavé diamond dial and green emerald bezel. 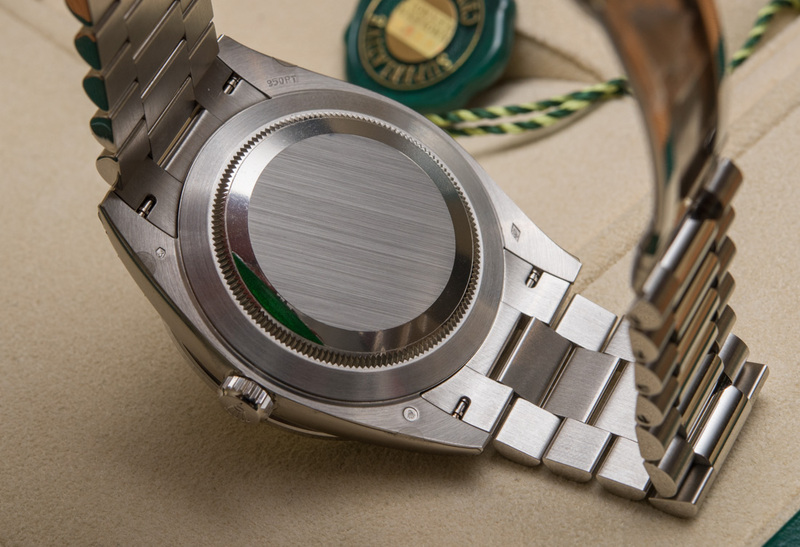 Details are spot on, including the subtly curved Rolex crown and the rare, green date and day discs. Consequently, the watch itself is largely like a platinum Rolex Day-Date 40, no way around it. And accordingly, the movement inside is also Rolex’s new 3255 caliber (that we debuted last year here). 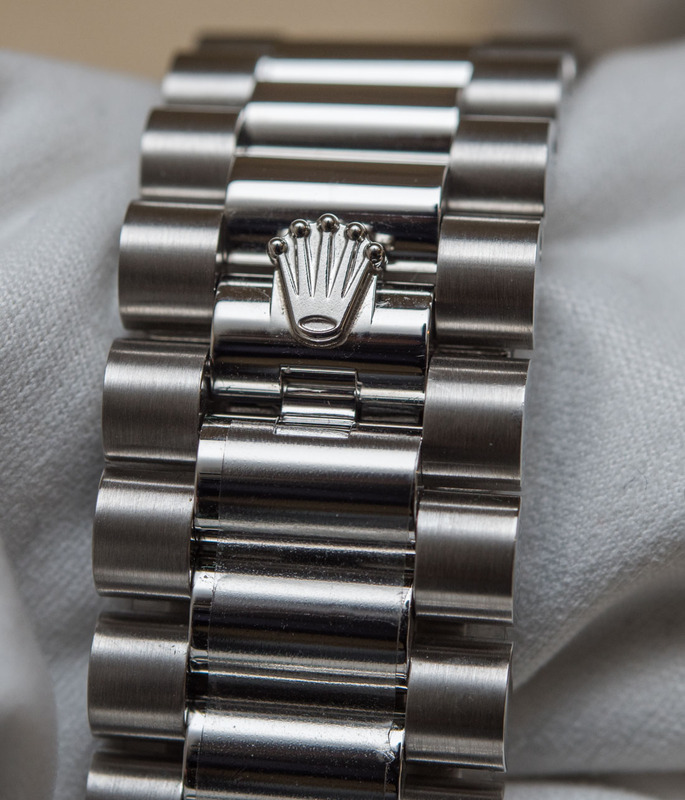 The 3255 was introduced with the Day-Date 40 at Baselworld 2015, and it is the first movement Rolex submitted to its completely overhauled and more stringent in-house tests. Rolex takes each 3255 that they have COSC chronometer certified to -4/+6 seconds of daily precision, cases it up, and tests it for a much more stringent -2/+2 seconds of daily accuracy (more details here about the new in-house tests concerning power reserve, water resistance, and accuracy). 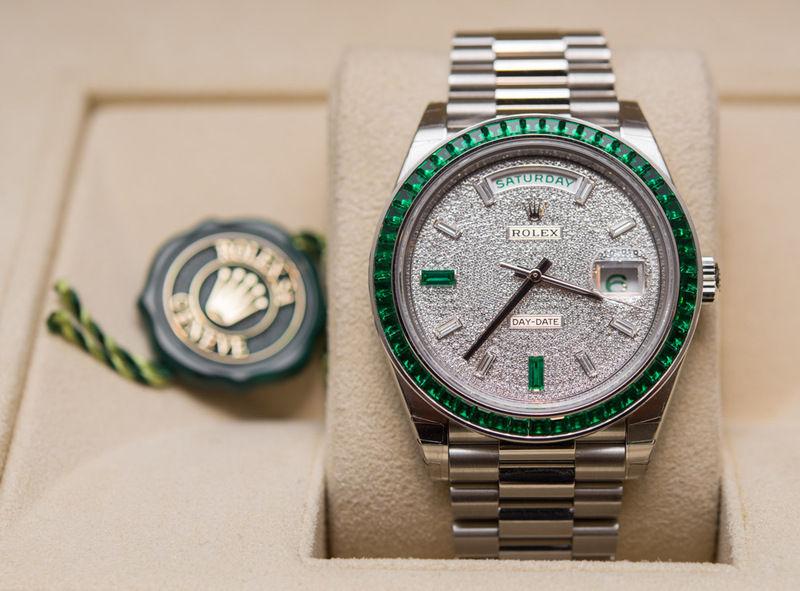 Sure, platinum Rolex Day-Date 40 watches are already a rare breed among Rolex watches produced today, but the complexity, refinement, as well as the high rarity-factor of the bezel and dial combination help this Rolex Day-Date 40 Green Emerald take things to the next level – pricing included, of course. Enough scrutiny, let’s see how the 228396TEM looks on the wrist. It is almost uncanny how different the Rolex Day-Date 40 Green Emerald looks off and on the wrist – and equally annoying how difficult it is to capture in still photography. Off the wrist, it appears visually front heavy – understandably so – while, on the wrist, the 40-millimeter-wide case (reduced from 41 when the Day-Date 40 replaced the Day-Date II in early 2015), super complex dial, and proportionate bezel look perfectly at home. 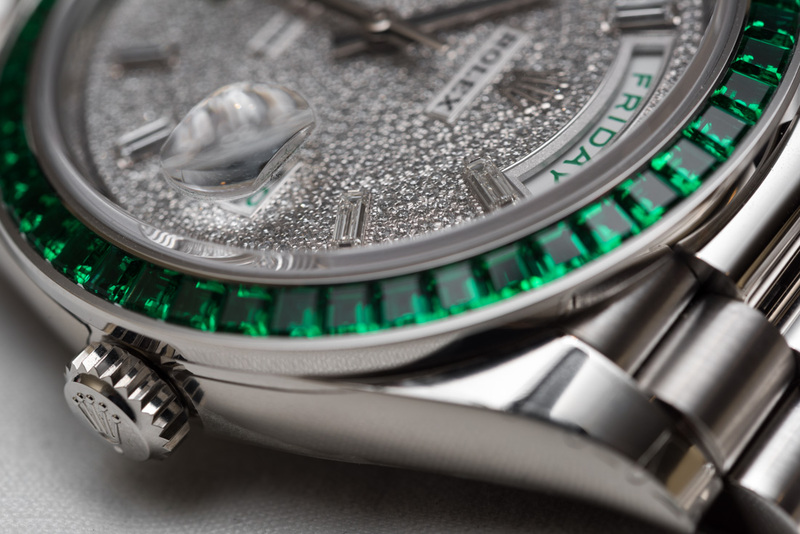 If you don’t like heavily bejeweled timepieces, this dripping-with-diamonds Rolex Day-Date 40 Green Emerald 228396TEM is not likely to change your mind. But if you have allowed high-jewelry watches to grow on you (as I have), then it will hit pretty much all the sweet spots: the weight of platinum is accompanied by such visual mass that you don’t even notice the heft (in fact, you may actually be expecting and demanding it), while the proportions and the modern – though by today’s standards rather conservative – 40-millimeter-wide case and excellent President bracelet make for a complete package we have grown to like so much in the new Rolex DD40. 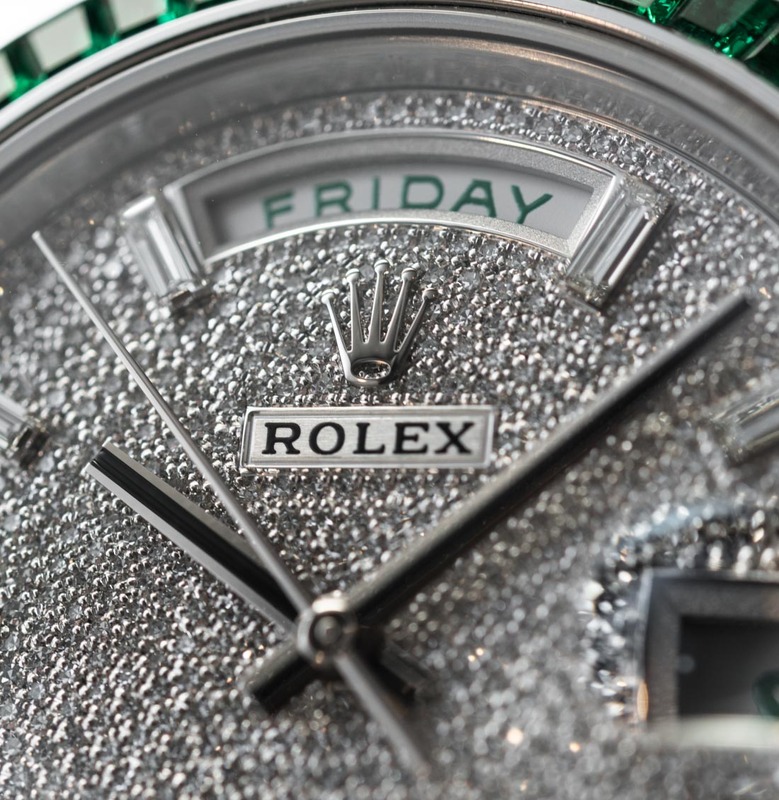 On a most personal note, I will say that those who know me would likely not describe me as the target audience for high-jewelry watches… and yet, I’d still totally wear the Rolex Day-Date 40 Green Emerald, just to simply enjoy the primordial joy that beautifully crafted, rare, shiny objects bring – and there are very few watches that can top Rolex when it comes to those.